The Wildlife and History Bike Tour incorporates information about local plants, animals and homes. Bring the group together for fun in the fresh air with activities that combine nature, education and exercise. From strolls on the beach while searching for seashells to hiking along local trails, spending time in nature has always been a popular method for people looking to unwind, and a recent study revealed just how beneficial it can be. Published by the Proceedings of the National Academy of Sciences of the United States of America, the study found that a 90-minute walk through a natural environment can decrease stress levels and help combat depression, among other ails. Aside from reduced stress, outdoor adventures lead to strengthened immune systems, improved focus, better quality of sleep and, depending on which activities you partake in, weight loss. The sun is also a significant source of vitamin D, which is important for cell growth. When outside activities are combined with exciting learning opportunities, they provide additional benefits for people of all ages. Walking, biking and even water-based tours available at Sea Island teach participants about the local environment, from marine life to historical homes. 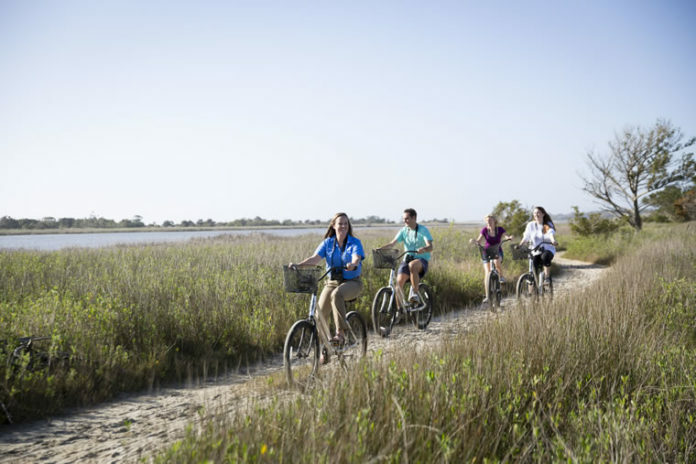 These Sea Island activities will give everyone the opportunity to get some fresh air while learning something new in the great outdoors. Young guests learn about the Island’s plants and animals firsthand. 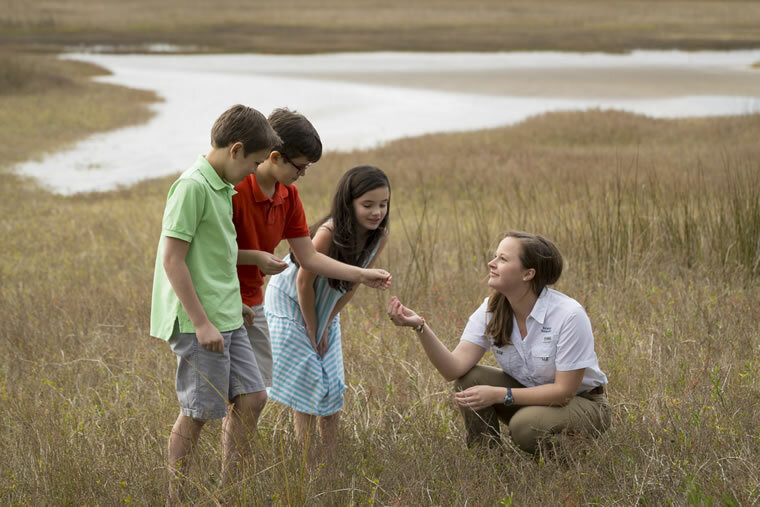 Those looking to get out and explore the wildlife surrounding Sea Island should start with the Marsh Habitat and Wildlife Walk. “Although leisurely, this allows the guests to get out and walk a bit,” Nyenhuis says of its benefits, adding that it’s a great way to get some exercise. The one-hour tour, which leaves from the Beach Club, leads guests out to Rainbow Island and back for a grand total of just under 1.5 miles. Wandering through maritime forests and salt marshes, naturalists educate guests on native plants and animals while seeking out nests from songbirds and birds of prey, which Nyenhuis says may not be spotted on the Island’s other tours. Sea Island homes and history, which most other nature tours on the Island don’t provide,” Nyenhuis notes. The Family Salt Marsh Kayaking tour gets guests into their kayaks following a paddling introduction at the dock. Navigating the narrow channels—some of which are the width of a kayak and therefore too narrow for larger boats—allows visitors to really connect with the nature and wildlife surrounding Sea Island. “You could leave from our dock and go 3 to 4 miles without seeing a dock, a power line or another boat,” says Gavin Earl, water sports manager at Sea Island. “It’s just a wild place and it’s right there in our backyard.” Expect to spot everything from nesting birds and trout to blue crabs, shrimp and oysters. Offered four nights a week during the summer season, the Sea Turtle Education and Night Walk is a unique way to get some exercise in—with a 2-mile walk through sand—but it doubles as a very special opportunity for lucky participants to view wildlife up close. The tour begins with a presentation on the life cycles and nesting habits of turtles, followed by a walk on the beach in search of some of these nests, which Nyenhuis says is something people can spend decades trying to witness. “Seeing them is never guaranteed and can be pretty rare due to the amount of beach we are able to cover on foot, but when we get lucky it is such an incredible experience,” she says. 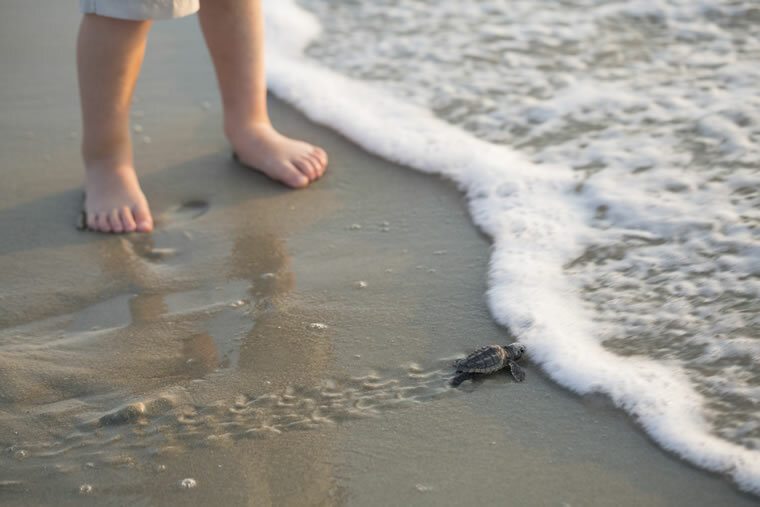 Few other experiences will delight children and adults alike as much as watching tiny loggerhead hatchlings heading for the water.